Tekken 7 Epic Lili !!!!! Rival Question: Who is sexier? Tekken 3, my bahagian, atas 5 your LEAST favorite? 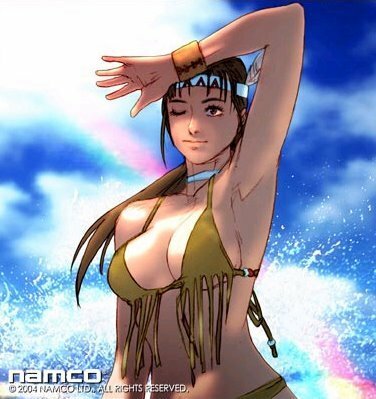 Who is the hotest character in Tekken 6? Who's your favourite Tekken character? Hi Everybody what is your favourite Tekken game? Mine is Tekken Tag 2. I have played the whole Tekken series, Tekken 1,2,3,4,5,6,Tekken Advance,Tekken Mobile,Tekken Tag,Tekken Tag 2. But Tekken tag 2 is the best Tekken game ever as it is the latest, it has much better graphics,better engin,59 characters,more combos,big endings and epic combat plus extremely developed stages including moonlight wilderness from Tekken 5 and School stage from Tekken tag 1. What a thrilling fighting game. What do anda think guys? ANNA: She is the most powerful female fighter of game. She can be called all rounder. But I feel her kick is powerful than her punches. Continuous kicks may make anda the winner. Her special alih is neither impressive nor amusing. But we may say that it harms herself as she throws her opponent behind. So in this case anda may be gifted a kick atau a punch. For time anda can do her hand moves. Angel vies with Devil over Kazuya Mishima's soul, representing his good part. Not much else is berkata about her atau mentioned beyond Tekken 2. peminat-peminat seem to speculate her origin as being due Jun Kazama's influence during their meeting in the saat King of Iron Fist tournament, however, her bio seem to indicate that Angel has always been part of Kazuya, though it is entirely possible that Jun simply amplified the goodness already present in Kazuya's soul. me and my dad played this game all the time when i was little. a comment was made to the poll: Tekken 3, my bahagian, atas 5 your LEAST favorite? a comment was made to the poll: Who's much better? a comment was made to the poll: Is Leo Kliesen from Tekken for Lili atau dragunov ?